Written by Irene Anton on April 27, 2017 . Posted in Science outreach. 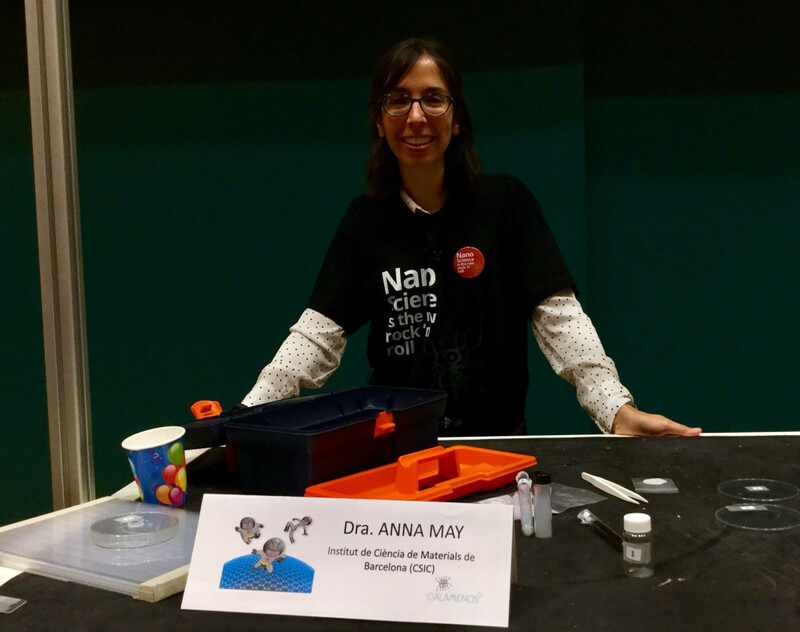 Yesterday (26th April 2017) two members of the N&N Group actively participated in a science outreach festival called 10alamenos9: Nanoscience and Nanotechnology Festival! The aim of this event is to bring nanotechnology closer to society. 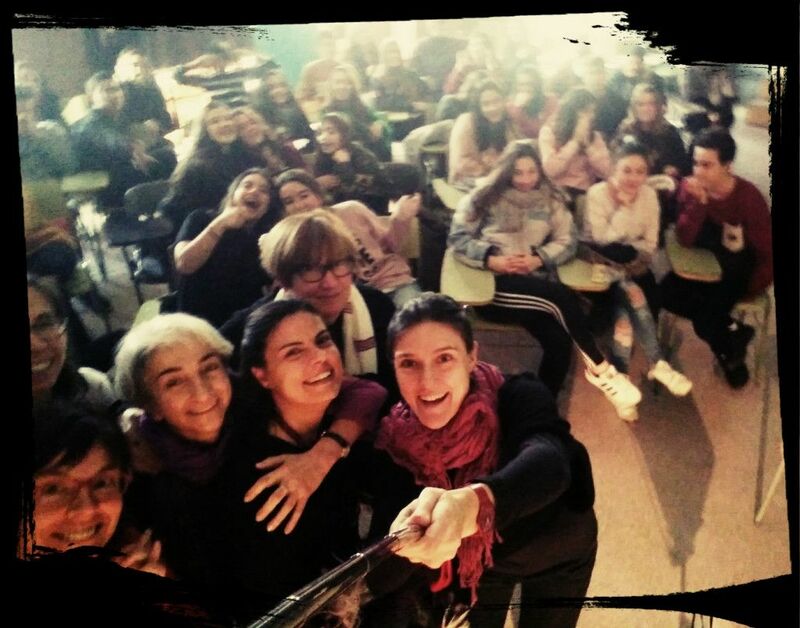 It is addressed to people of all ages and educational backgrounds and takes place in different cities in Spain. In Barcelona, Anna May participated in an interactive seminar that took place in the science museum CosmoCaixa. 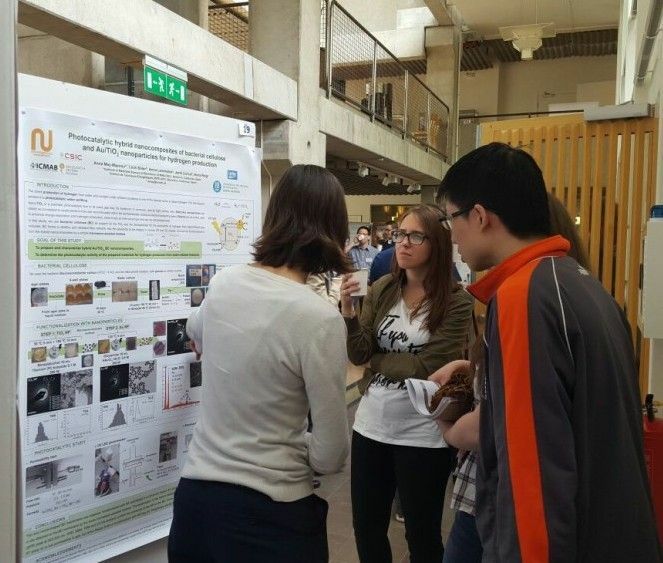 She showed some of the materials synthesized at ICMAB. Anna May at the 10alamenos9 festival in CosmoCaixa Barcelona). 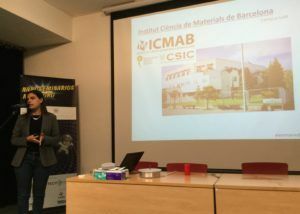 Together with Alex Argemí (ICN2) and Francesc Pérez-Murano (CNM), from the Barcelona Nanotechnology Cluster – Bellaterra (BNC-b), Anna Laromaine gave a talk on Nanomedicine in Casa de la Cultura de Sant Cugat. In the event, ESCIENCIA also participated with some demonstrative experiments. Written by Anna May on March 28, 2017 . Posted in Group activities, News. Anna May, postdoc in our group, is from now on the new Communication & Outreach Officer at ICMAB. Anna holds a PhD in Materials Science and Technology and is currently studying a postgraduate course in Science Communication. We wish her all the luck in this new endeavour! Written by Anna May on February 23, 2017 . Posted in News, Science outreach. 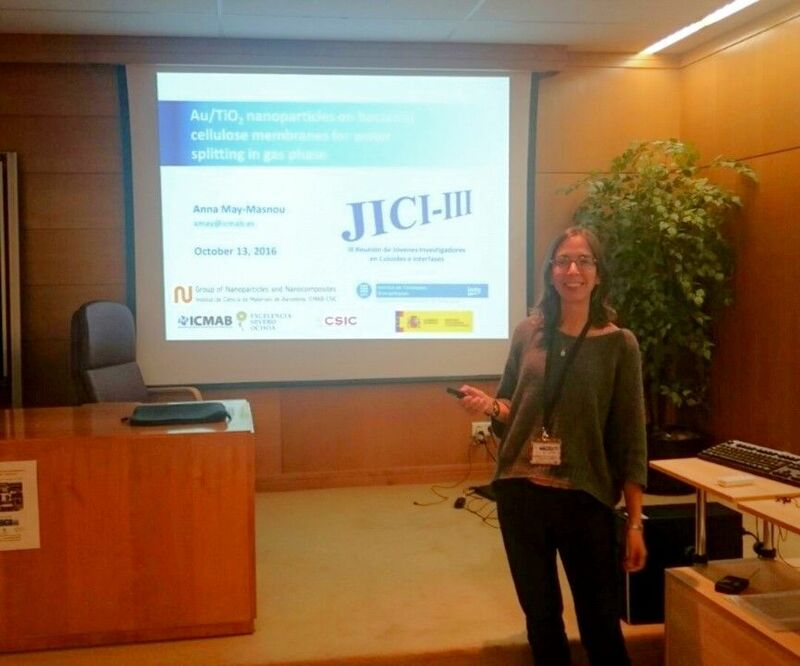 Anna May has participated this week in the course “El científico ante los medios de comunicación“ organized by Fundación Dr. Antonio Esteve, Indagando TV, Instituto RTVE and CSIC, with 25 other scientists of different fields. 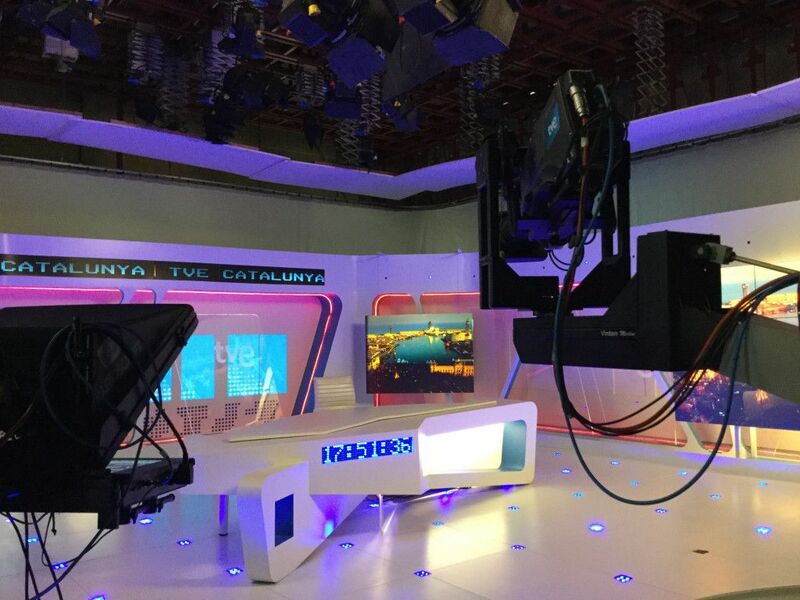 The course took place at the RTVE (Radio y Televisión Española) studios, in Sant Cugat del Vallès. 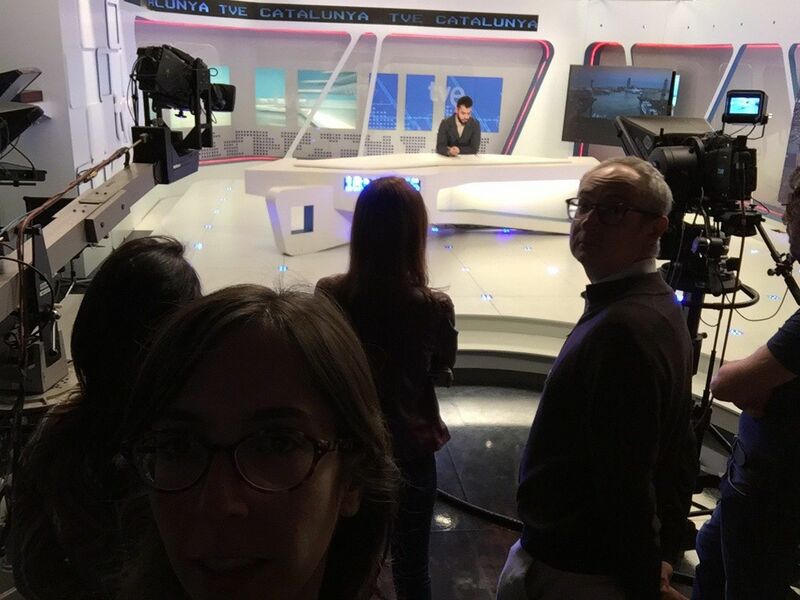 This experience of two days gives the opportunity to scientists to see the dynamics of working in the media, with the aim that they learn to master the everyday situations, such as TV interviews, news writing, and press conferences, and learn to communicate science. 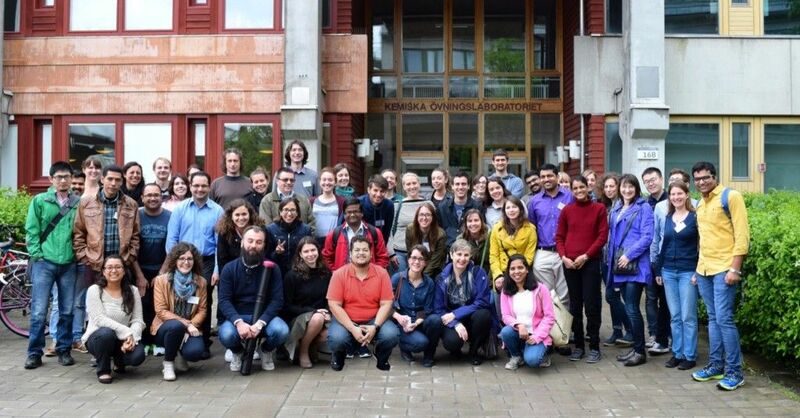 Apart from the audiovisual media, the course is also dedicated to radio programs, institutional communication, science communication agencies and science outreach on the Internet. 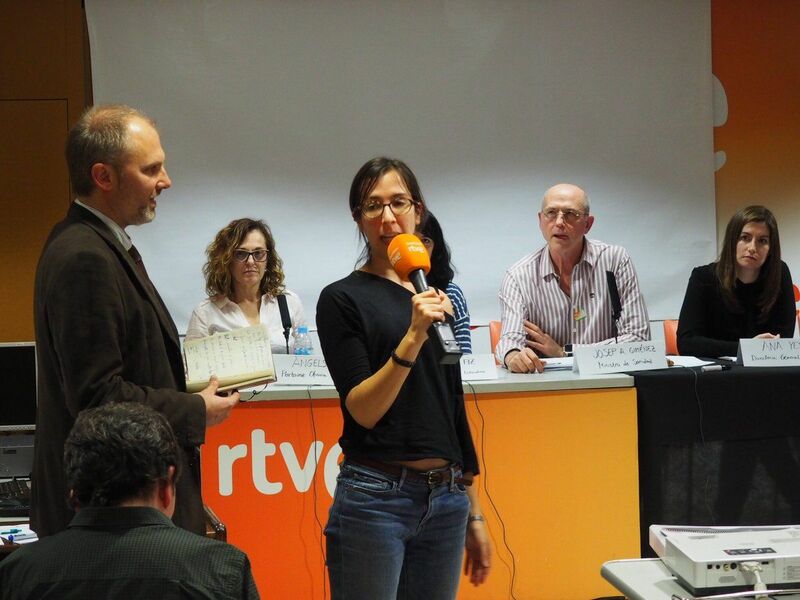 Some of the professionals that give the course are Graziella Almendral (Indagando TV), Ana Montserrat Rosell (Tres.14), Miguel Ángel Martín (Instituto RTVE), Marta Cáceres (Para todos La 2), Juan Antonio Senante (RTVE), Isidre Ramos (RTVE), Jaime Pérez del Val (CSIC), Pablo González Batista (M80), Adeline Marcos (Agencia SINC), Pere Buhigas (Lab24), and Marc de Semir (Fundación Bertelsmann). Written by Anna May on February 6, 2017 . Posted in News, Science outreach. This week ICMAB participates actively in the International Day of Women and Girls in Science, which is on February 11. 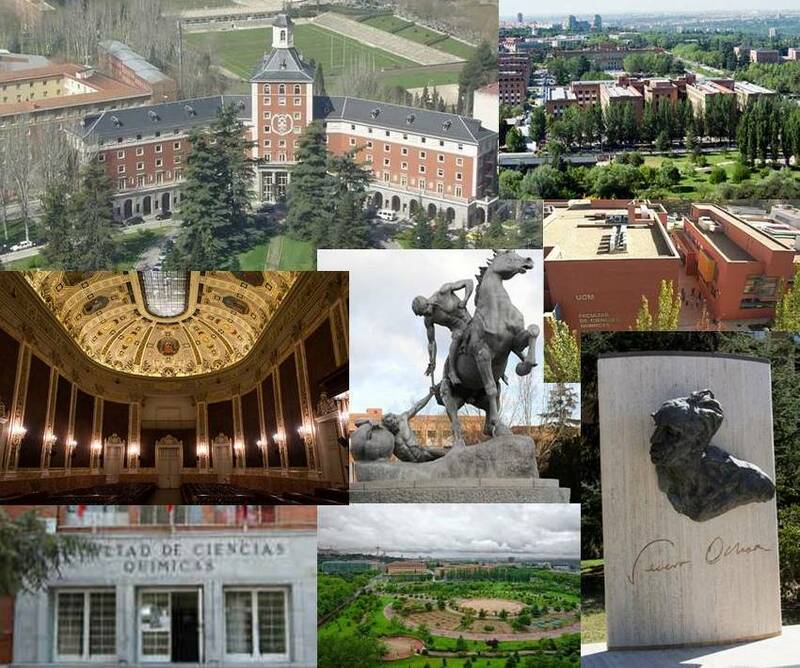 The activities in Spain are gathered under the name “11febrero” and can be found in the webpage https://11defebrero.org/. 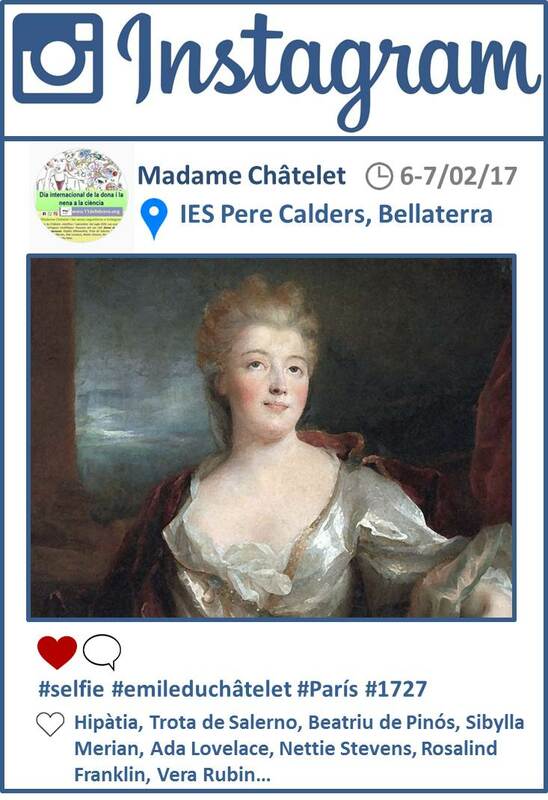 Anna Roig, Anna Laromaine and Anna May, from the NN Group, participate, together with other women* from ICMAB, in the play “Madame Châtelet and her Instagram followers”, in which different scientific women meet at Madame Châtelet’s palace and explain their live and their discoveries. The scientists that appear are: Émile du Châtelet, Hypatia, Trota of Salerno, Beatriu de Pinós, Maria Sibylla Merian, Ada Lovelace, Nettie Stevens, Rosalind Franklin, Vera Rubin and Margarita Salas. The piano player is Hildegard of Bingen. Other scientists mentioned in the play include Caroline Herschel, Mary Anning, Lise Meitner, Irène Joliot-Curie, Barbara McClintock, Dorothy Hodgkin, Maria Goeppert-Mayer, Rachel Carson, Gertrude Elion and Rita Levi-Montalcini. 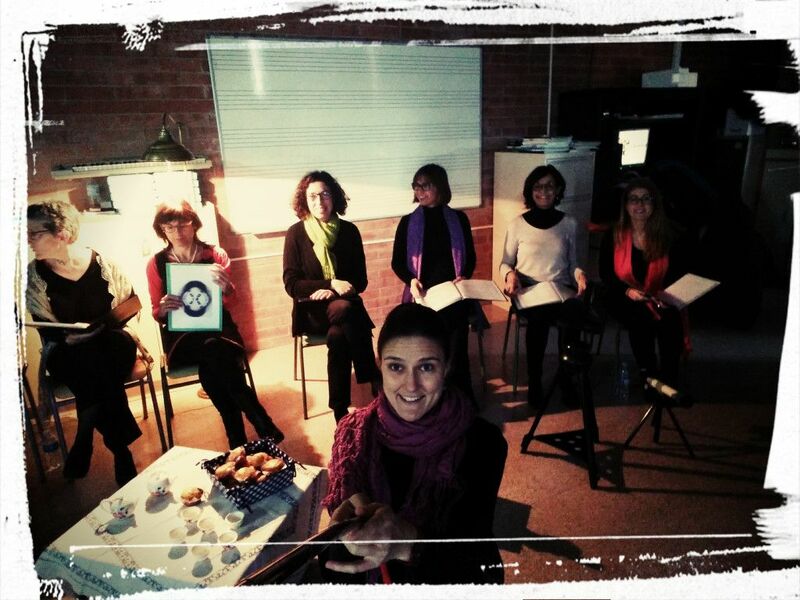 *The other women from ICMAB are: Mariona Coll, Marta Vendrell, Carmen Ocal, Arántzazu González, Rosa Palacín, Núria Aliaga, Esther Barrena, Rosario Núñez, Joana Martínez and Susagna Ricart. Written by Anna May on October 18, 2016 . Posted in News, Projects. 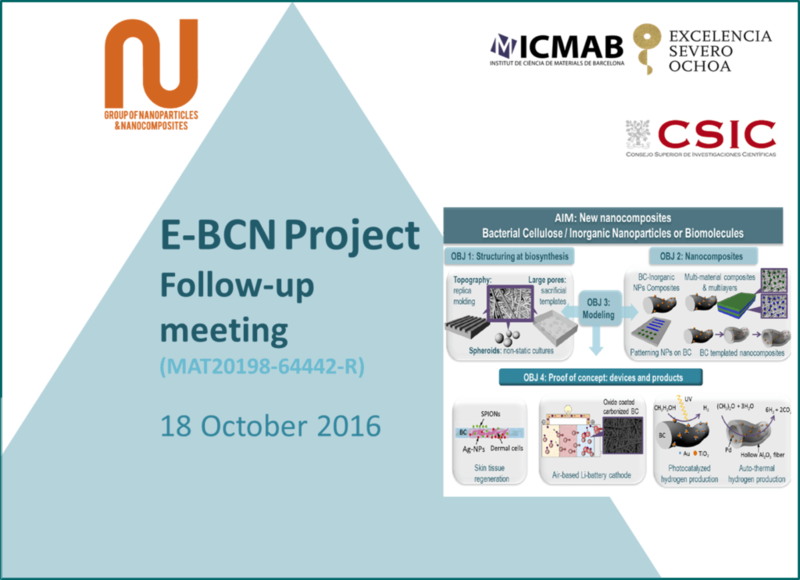 Follow-up meeting after seven months of starting the E-BCN project (Engineering Bacterial Cellulose Nanocomposites). 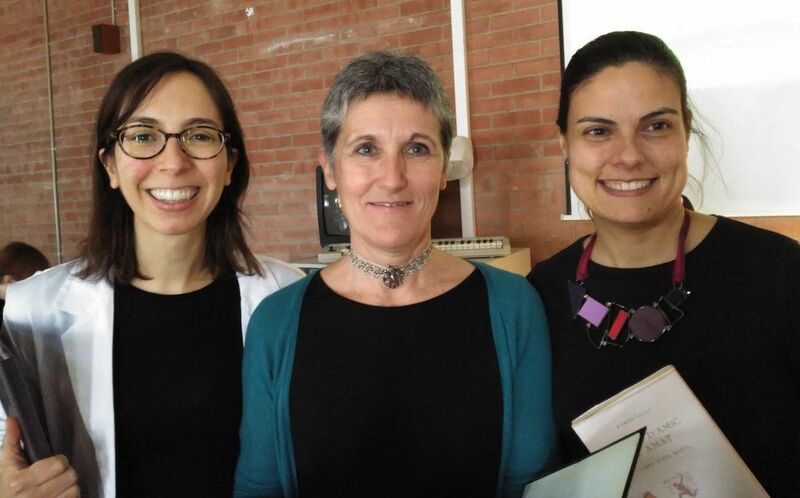 Two PhD students, Soledad Roig and Irene Anton, will be added to the project team. 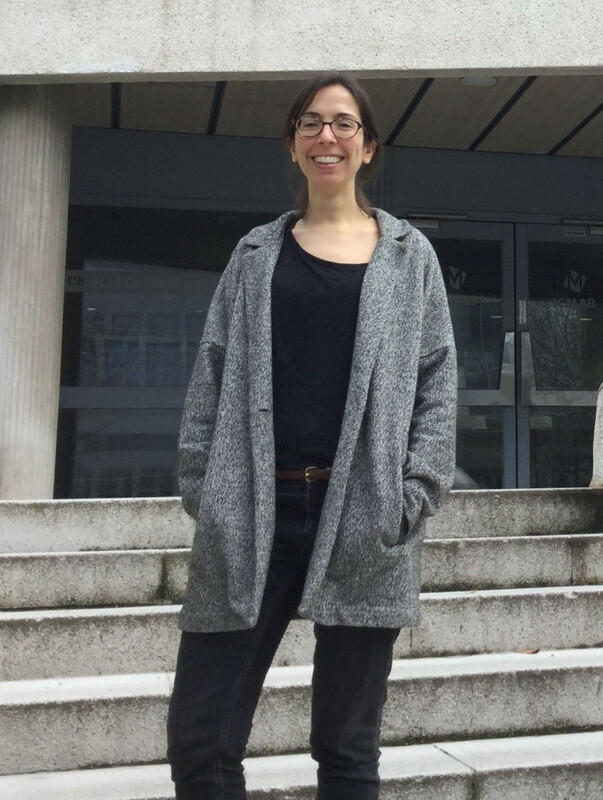 Soledad will work in structuring and patterning bacterial cellulose, and Irene in applying bacterial cellulose nanocomposites for skin regenaration. 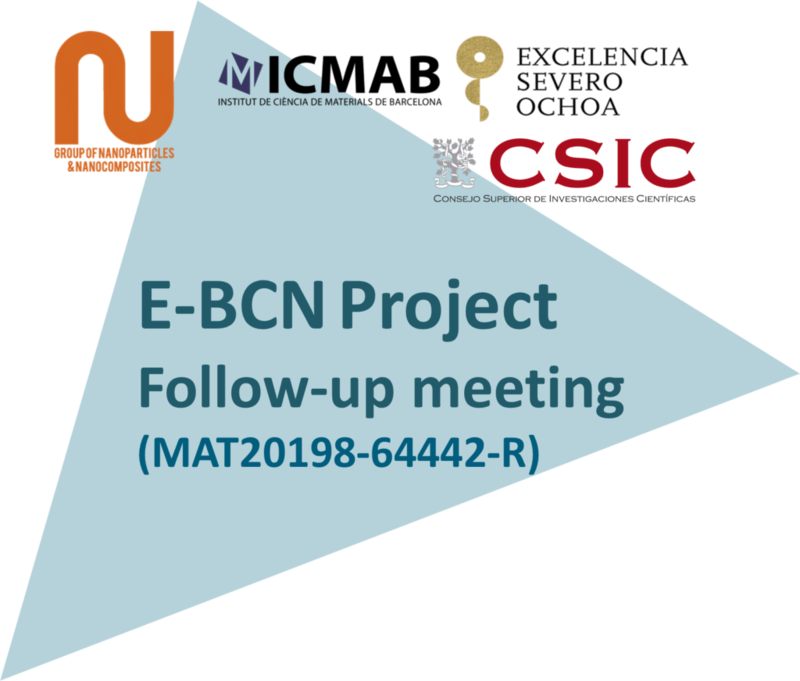 Participants of the project include: Anna Roig, Dino Tonti, Jordi Faraudo, Anna Laromaine, Martí Gich, Anna May, Soledad Roig and Irene Anton. Written by Anna May on September 13, 2016 . Posted in Conferences, Group activities, News, Science outreach. 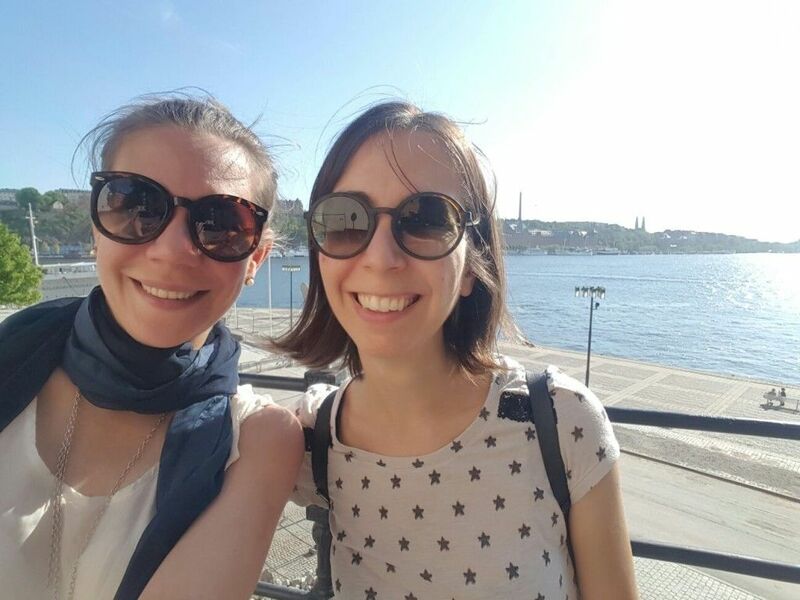 Anna May and Irene Anton have attended the Campus Gutenberg for scientific communication and culture during September 12-13, at the Universitat Pompeu Fabra (UPF) – Campus Mar and at the Barcelona Biomedical Research Park (PRBB). The conference consisted of some interesting debates on “How to measure the excellence and the impact of science”, “Great discoveries and controversy in the media”, or “Science museums and schools: how to develop mutual relations”. The other sessions consisted of different workshops about science, education, communication, social media, etc. 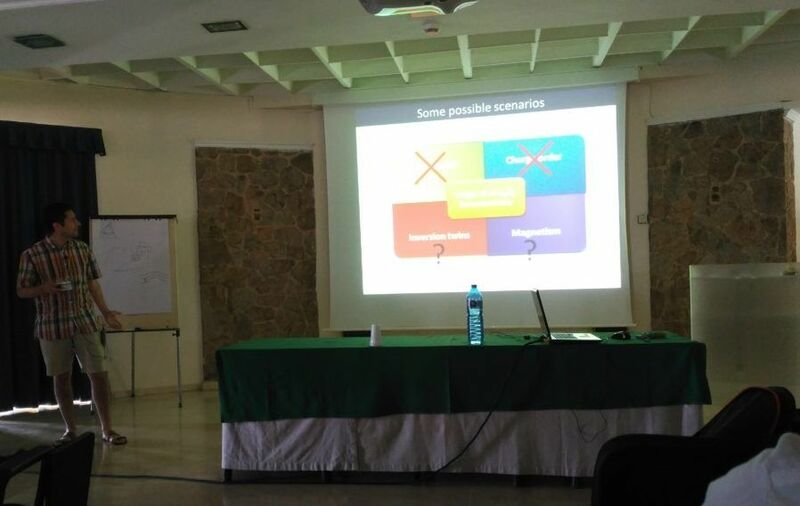 A special mention to the session by Ignacio Morgado (from the Institute of Neuroscience of the UAB) on “Perceptual illusions: is the world how we see it?“, in which he made the audience realize that a lot of what we see, smell, hear… is only in our brain. Fix the eye for one minute in the cross on the top-left side of the picture, and then move the eye to the right side. If everything works, you will see a greenish colour. 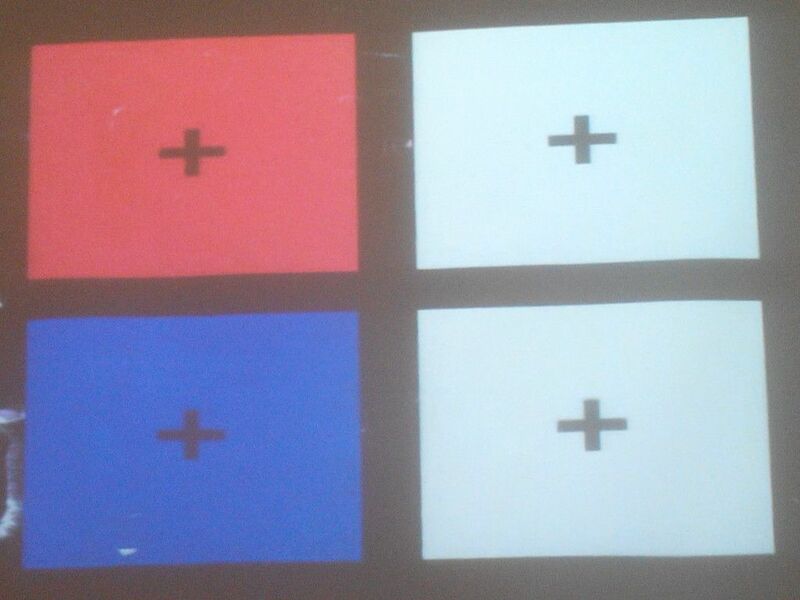 Repeat for the bottom-left cross, and then you will see a yellow colour on the bottom-right. Does it work? 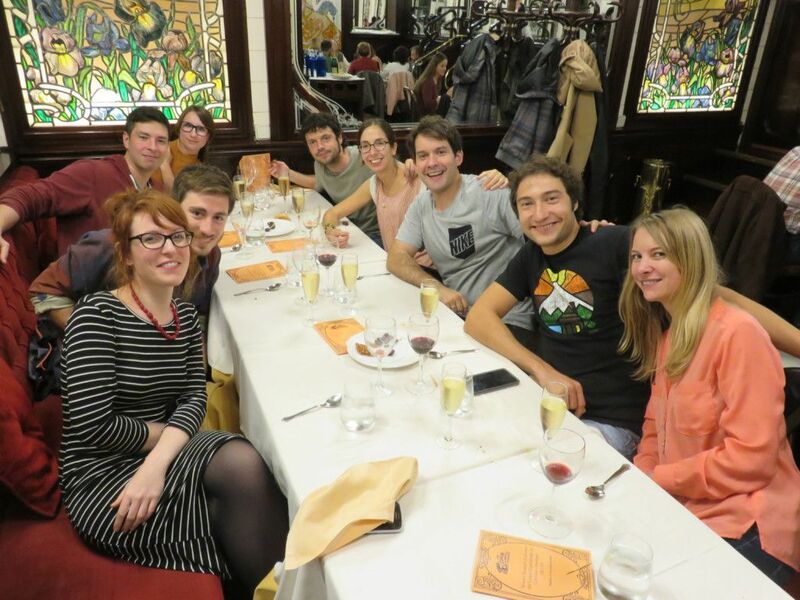 Also, a special mention for Escolab, a platform that organizes visits to Catalan research centers for secondary students, and Pendulum, an association that brings the kids to the nature for a scientific picnic in the middle of the Montseny Natural Park, among other scientific workshops and activities. 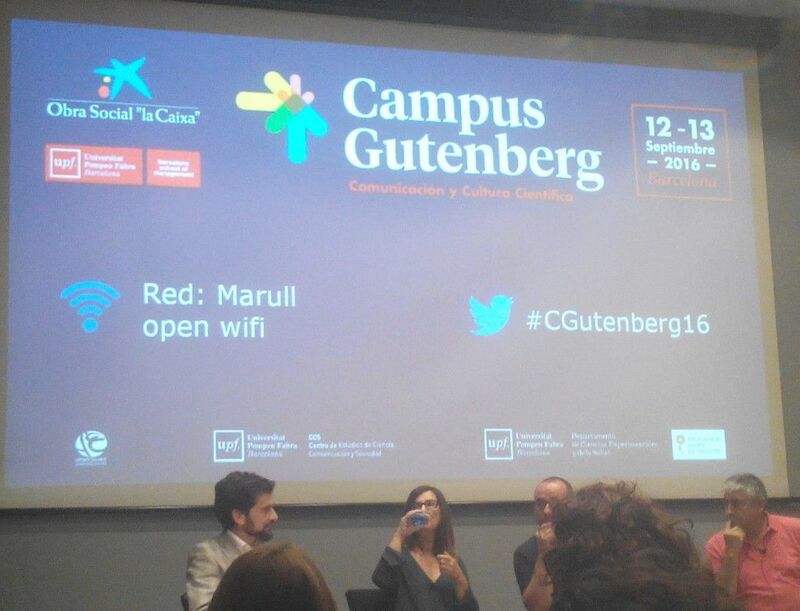 Campus Gutenberg is organized by the Universitat Pompeu Fabra (UPF)-Barcelona School of Management and Obra Social “la Caixa”. Collaborators of this edition are “Centro de Estudios de Ciencia, Comunicación y Sociedad” (CCS-UPF), the “Associació Catalana de Comunicació Científica” (ACCC), the Barcelona Biomedical Research Park (PRBB), and the Department of Experimental and Health Science of the UPF. Written by Anna May on June 10, 2016 . Posted in Conferences, News. 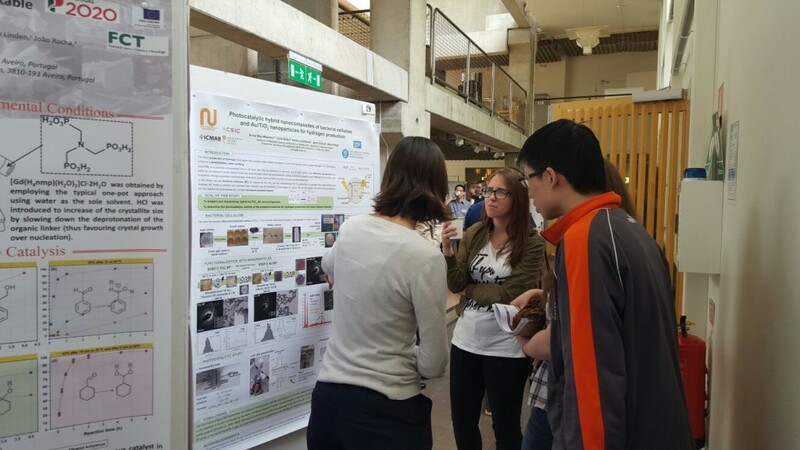 The NANOSELECT Annual Meeting in Sant Feliu de Guíxols has ended.The meeting has been full of talks about different topics, such as functional oxides, ferromagnetic materials, superconductors (YBCO and others), semiconductors for water splitting, Nanocosmos, alternatives of Li-ion batteries, and many other interesting topics. The meeting was held in Eden Roc, a nice hotel in Sant Feliu de Guíxols, between 8th and 19th June. 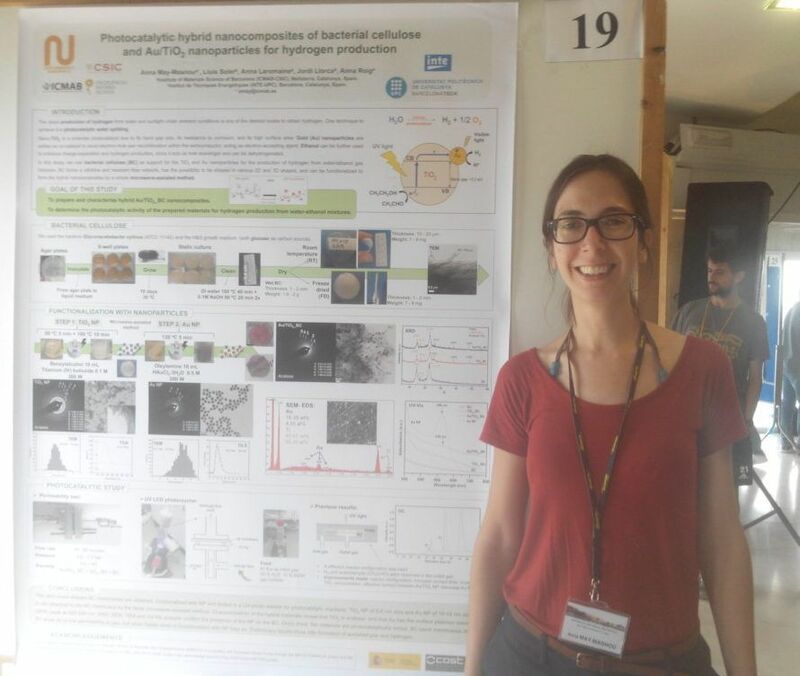 Here you can find the contributions of the N&N Group, Martí Gich giving the talk “Ferroelectric domains and polarization switching ine-Fe2O3“, and the poster “Magnetic properties above room temperature in magnetoelectric e-Fe2O3“, and Anna May with the poster ““Photocatalytic hybrid nanocomposites of bacterial cellulose and Au/TiO2 nanoparticles for hydrogen production“. Written by Anna May on June 7, 2016 . Posted in Conferences, News. The NANOSELECT (Advanced materials and NANOtechnologies for innovative electrical, ELECTronic and magnetoelectronic devices) celebrates its Annual Meeting on 8th-10th June 2016 in Sant Feliu de Guíxols (Girona). 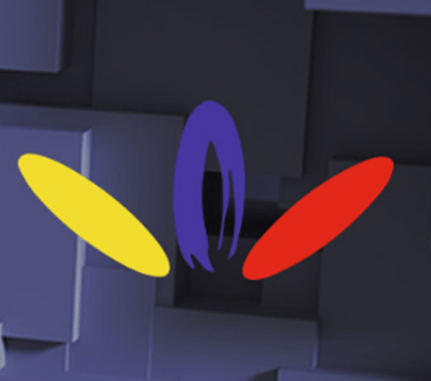 The Network of Excellence (NOE) NANOSELECT is a natural continuation of the corresponding Consolider Project which was focused in Functional Oxide Materials. The Meeting will be also supported by the Severo Ochoa Program. 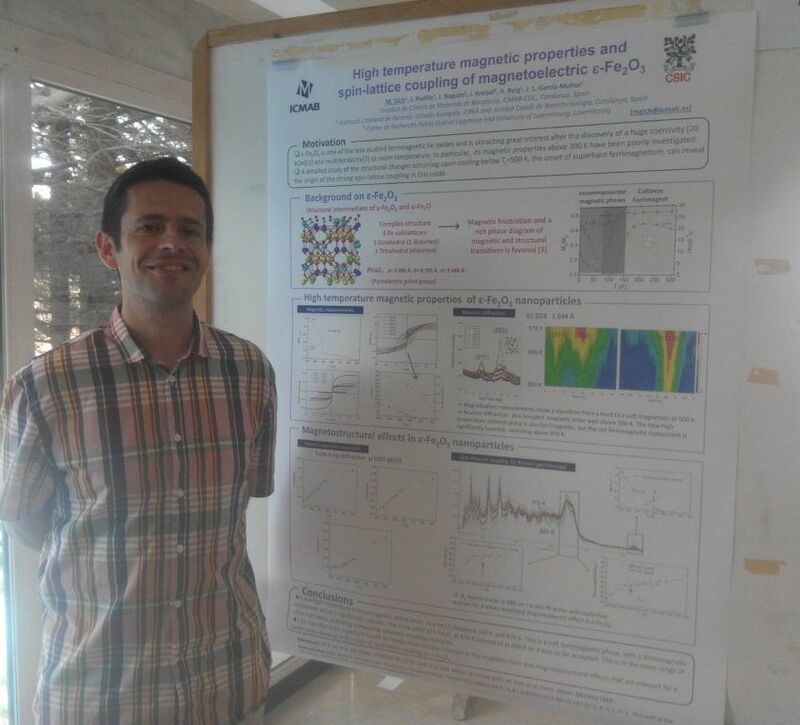 Martí will give the talk on “Ferroelectric domains and polarization switching in e-Fe2O3“, and will present the poster “Magnetic properties above room temperature in magnetoelectric e-Fe2O3“, whereas Anna will present the poster on “Photocatalytic hybrid nanocomposites of bacterial cellulose and Au/TiO2 nanoparticles for hydrogen production“. The program of the meeting is found here: NANOSELECT NOE_06062016.